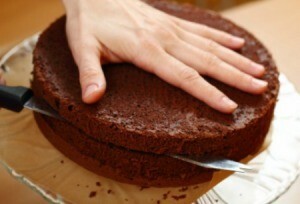 In three dimensions, what is the maximum number of pieces you can cut a cake into with one cut? Two cuts? Three cuts? What is the general formula for n cuts? You may find it useful to think of the “pizza numbers” – maximum number of pieces you can get from a pizza, in two dimensions, with n cuts: 1, 2, 4, 7, 11, 16, 22, 29… (bit.ly/pizza-n). F(0) = 1; M(0) = 0. • By using a spreadsheet program with VLOOKUP, or by hand, calculate values of F and M up to n=55. • What can you find about when F(n)≠M(n)? No attempts on this one. Because of AS exams, End of Year exams, and all that, I guess. Anyway, click here for the answer. g(0)=0 and g(n) = n − g(g(n−1)) for n>0. • Prove by induction that 0<g(n)<n for all n>0. • Calculate g(n) for n=1 to 21 (VLOOKUP in Excel may help you with that). The tree above is values from a similar recursive definition, set out by writing below each number m the values n for which g(n)=m. • How would the tree for the values you have calculated compare? 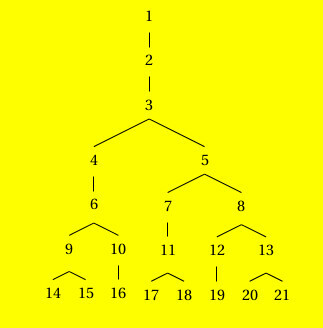 • What famous sequence do you see in the tree? • What recursive definition would produce the tree on the left? Howard Tran won the prize with the best effort at a solution: see https://mathsmartinthomas.wordpress.com/2018/02/15/maths-prize-2-march-2018-recursive-definition/. A language has an alphabet of 3 letters, M, I, and U. Words are formed in this language by the following rules (where “x” and “y” represents any string of letters, not necessarily words). Question: is MU a word? (This puzzle is taken from Douglas Hofstadter’s book Gödel, Escher, Bach, where it is used introduce thinking about some of the maths important for computer science). The prize was won by Mohaned al-Bassam. Maths prize 24 Jan: how tough is the smartphone? A new smartphone will survive being dropped several storeys. But how many? A 64-storey drop will smash it. Given a 64-storey building, how can you find the exact maximum drop in just six experiments? And how many phones do you need for that? A Freddo and fame for every solution, or good attempt, to Mr Thomas by Friday 24 January 2018.